Early morning Chimpanzee tracking in Nyungwe Forest. Optional walk to the waterfall or visit to the Angolan Black Colobus monkeys (both activities optional).Nyungwe Forest is East Africa's largest forests, with 13 monkey species, including chimpanzees, Angolan Black Colobus, Mona Monkey and Owl Faced Monkeys. Today we drive to the Volcanoes National Park. It is possible to visit the local people or the pygmies (both activities optional).Volcanoes National Park is a unique jungle, with many monkey species, including the endemic Golden Monkeys. 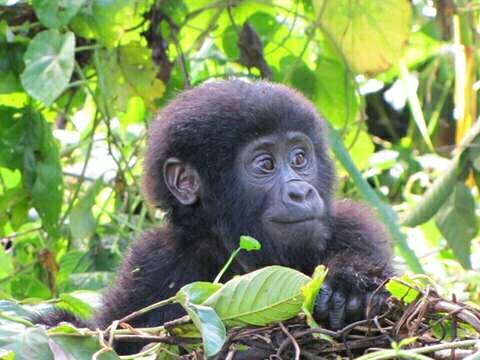 Volcanoes National Park is part of the Virunga Mountains, covering Uganda, Rwanda and Congo, and one of the two places in the world where you can find Mountain Gorillas!